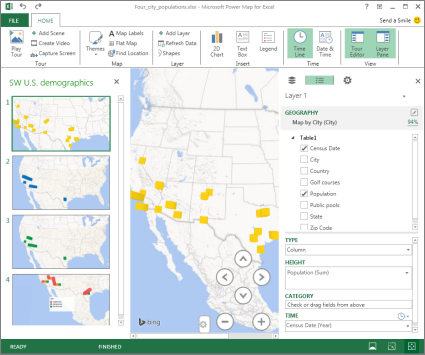 A Microsoft 3D Maps tour can show a time-based relationship between geographic locations and their associated data—such as population numbers, temperature highs or lows, or flight arrival delays. When you start 3D Maps from a workbook that doesn’t already contain a tour, a new tour with a single scene is automatically created. Tours and scenes are the basic way to save the 3D Maps visualizations of your data. You can create as many tours as you want in a workbook. You switch between tours and create new tours by using the Launch 3D Maps box. 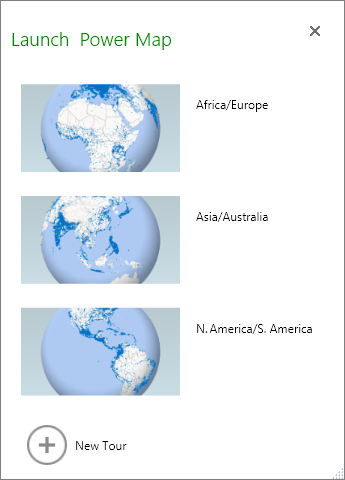 This example has three tours that show world population by continent. Click Insert > 3D Map > Open 3D Maps. The Launch 3D Maps window appears, showing your new tour. The Launch 3D Maps box appears. The new tour appears in the Launch 3D Maps window. If another tour was already open, 3D Maps closes it. There’s no Save button in 3D Maps; all tours and scenes are preserved in the state in which you close the window. When you save your workbook, any 3D Maps tours and scenes are saved with it. All changes you make to a scene in 3D Maps while editing are saved automatically, but any changes you make to a scene in tour playback mode—such as resizing, removing a legend, or removing a timeline—aren’t saved. All tours open in edit mode by default, and all the scenes in a tour are shown in the Tour Editor pane. To learn about adding scenes to a tour, see Add or move a scene in a 3D Maps tour. 3D Maps always plays a tour in full-screen mode. Playback buttons are available at the bottom of the screen. Open the tour from the Launch 3D Maps box. In the 3D Maps window, on the Home tab, click Play Tour. In the workbook, click Insert > 3D Map > Open 3D Maps. 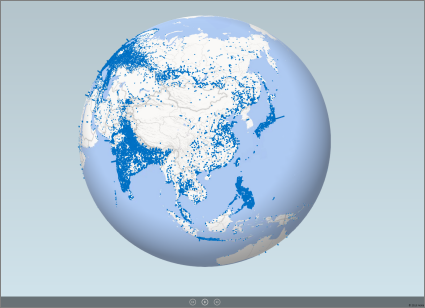 In the Launch 3D Maps box, right-click a tour and click Duplicate. This creates a new tour that you can fine tune, while leaving the original tour untouched.